This lantern-shaped pendant would originally have enclosed a miniature devotional sculpture like 1. 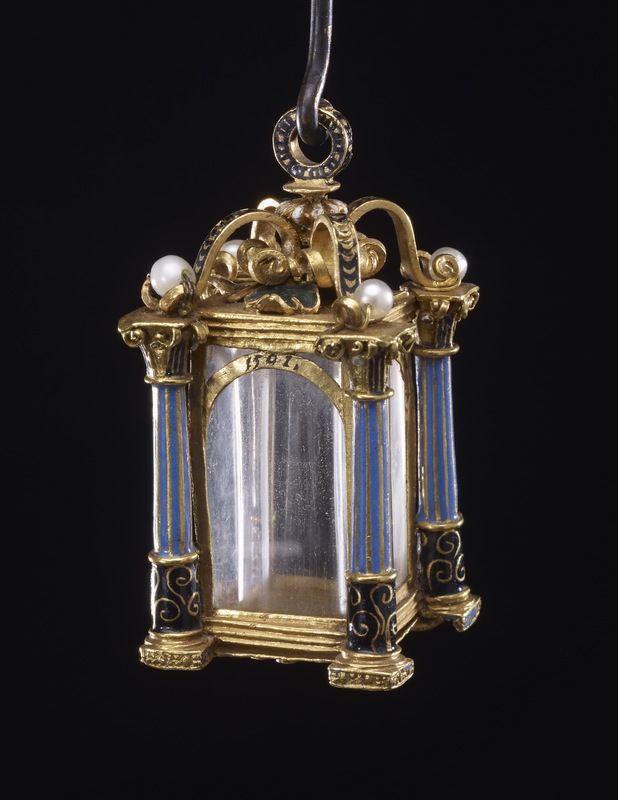 Lantern-shaped pendant reliquary; gold; middle formed of square tube of rock crystal with column at each corner, enamelled; bottom with quatrefoil; beneath, four enamel scrolls, pearl at termination of each; date engraved on one side. See below for previous Tait catalogue enry on this object from 1986, the 1591 date is now thought to be genuine. Origin: Uncertain, traditionally attributed to a German workshop in the late 16th century but probably of 19th-century manufacture. (i) The gold 'tendrils' against the black-enamelled ground are feebly executed and lack the characteristics of a Renaissance scroll design. (ii) The enamelled floral pattern on the underside and on the ‘roof’ does not seem to be part of the repertoire of Renaissance ornament; significantly, the curious trefoil-ended leaf recurs on the side of the handle of the agate scent-bottle pendant (WB.185) which, upon careful examination, does not seem to date from the seventeenth century as hitherto published. For a correct version of this kind of enamelled floral base see the underside of the St Anthony figure illustrated in Priscilla E. Muller, ‘Jewels in Spain, 1500 – 1800’, The Hispanic Society of America, New York, 1972, (p. 75, fig. 109 and col. frontispiece). (iii) The extraordinarily rough and unfinished quality of the corners of the base is incompatible with this kind of expensive luxury object. (iv) The four pearls are crudely wired on but it appears that they do not take the place of some other motif; consequently, there would have been a gap at each corner of this poorly designed ‘roof’. (v) There is no Christian symbolism incorporated into the design, although it has been published and accepted as a 'reliquary' or devotional object in the past; indeed, it is difficult to think that it could have had any other function, unless specifically made for a modern collector's cabinet. (vi) The addition of the engraved date - without any owner's initials or any dedicatory words - is less than convincing on so trifling a jewel unless it, too, was aimed at the modern collector, who so often prefers pieces of reference value. At present it still appears to be the only dated version to have come to light. (vii) Unlike WB.183 the construction of this piece lacks the logic and the traditional methods of a Renaissance goldsmith. Furthermore, it is remarkably undamaged for so simple a devotional object which nevertheless has lost its interior carving or miniature sculpture - if, indeed, one had ever existed. Hugh Tait, 'Catalogue of the Waddesdon Bequest in the British Museum. 1., The Jewels', British Museum, London, 1986, no. 47, pl. XXVIII, figs. 205-207.